Oil paints, with oil as a binding medium have been widely used by artists since the fifteenth century. 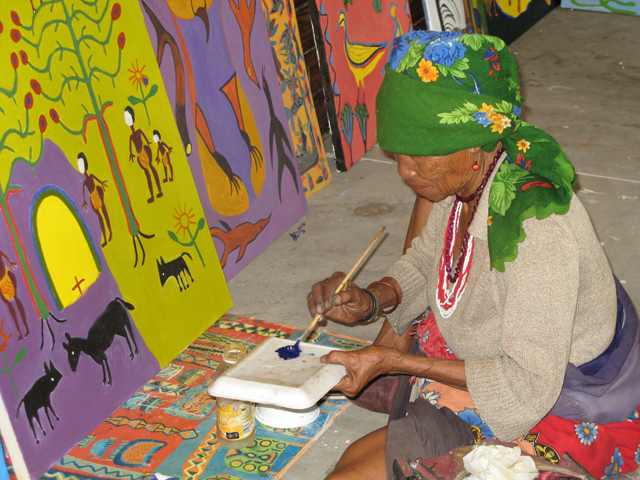 The Kuru artists have adopted this tradition and they are well known for their brightly coloured oil paintings on stretched canvas. Most of the artists love to sit flat on the floor while working on the paintings laying either flat before them or positioned against a wall. In winter they love to take their paintings outside and work in the warm winter sunshine. 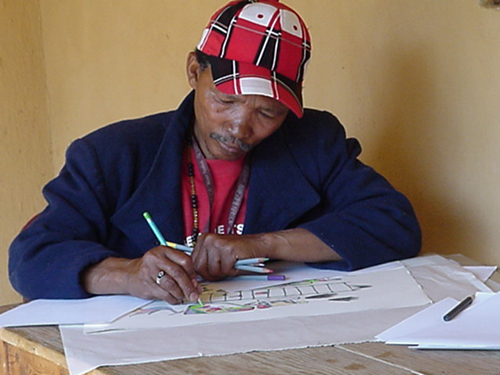 Although most artists start directly with the paintbrush on the canvas, some artists make preliminary drawings with pencil on the canvas before starting to apply the paint. When a painting is sold and need to be transported abroad it is best to take it off the stretch frame and send it rolled on a tube. The customer will then have to restretch it. 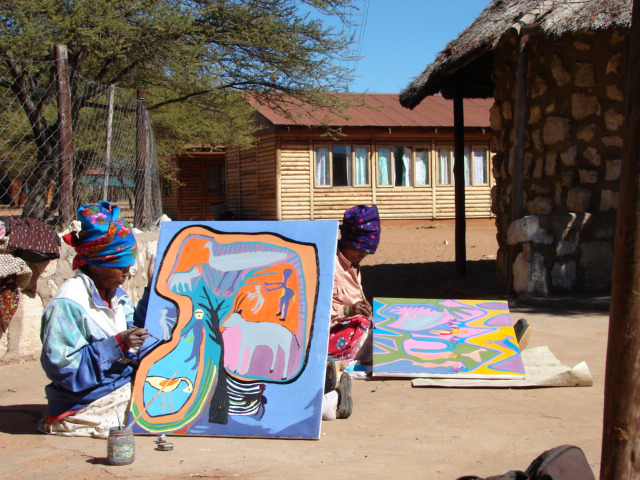 Recently some artists also experimented with acrylic paints on canvas. 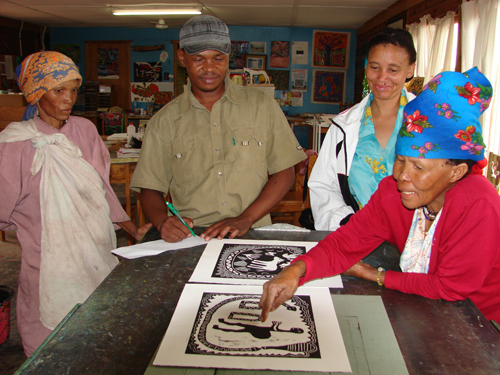 The Kuru artists make original prints using the relief printing techniques for linocuts, planographic for lithographs and intaglio for engravings on plastic or perspex. 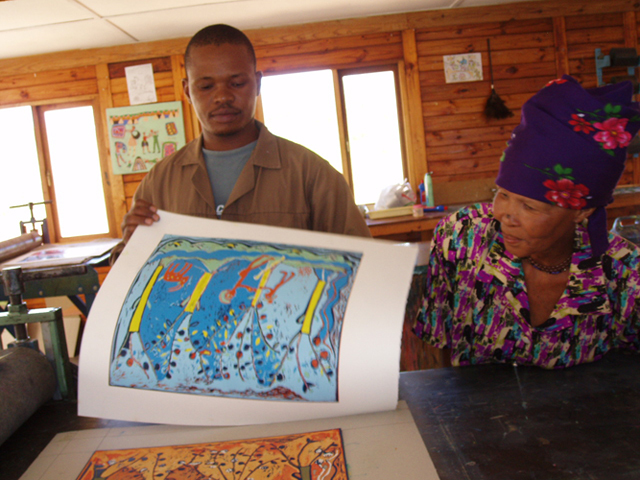 These printing techniques are used by artists worldwide and are recognized as original art pieces. The difference between these prints and prints that are reproductions of other original pieces is that the artists are involved throughout the whole printing process. Reproductions are normally printed photographically and fall in a different category than original artists’ prints. They are, at the best, reproductions and can never be the same as an original print, where the artist makes the design with the specific printing technique in mind and is involved in preparing the blocks by either drawing or cutting into them and assisting in the process of putting it through the press. 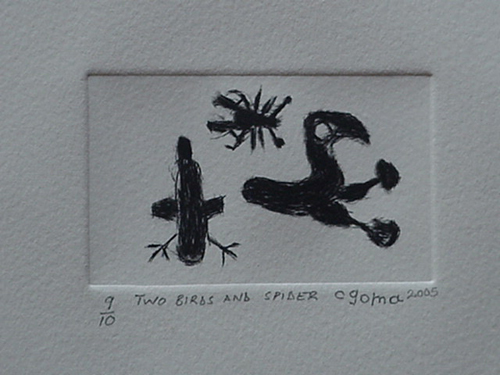 The artist also checks and signs each individual print in an edition to make sure that it is as he or she intended it to be. Because these prints are hand printed the printing editions are usually low and in the case of the Kuru artists will rarely exceed fifty. printer Ndodonyane Ditsheko and Lessie Morris, administrative assistant. Sara Cao signing her linocut. In this technique, the artists outline their image on a wood block or other surface. The artists then cut away pieces of the surface, leaving only the image raised. They then use a roller to apply the ink to the raised surface and transfer the image onto paper with a press or hand rubbing or burnishing. Since the recessed, cutaway areas do not receive ink, they appear white on the printed image. The primary relief techniques are woodcut, wood engraving and linocut. The Kuru artists are well known for their linocuts. 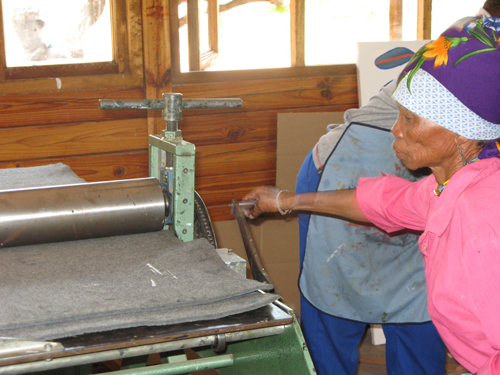 They use “Marley” floor tiles to cut into, as they are cheap and easily available. The Kuru art studio has two etching presses used by the artists to make their linocuts. Using a press to make the linocuts ensures consistency in the print quality throughout the run. Jan John inks a linocut in the Kuru printing studio. Reduction lino prints are coloured lino prints where the artist cuts the block further with each colour printed so that the final image is built up of colour overlays. The Kuru artists are making beautiful reduction lino prints, sometimes using up to six colours over each other. Intaglio prints, which include etching and engraving, define an image engraved below the surface of the material. This process is unlike relief printing in which the printed image is left on the surface, or lithography where the printed image lies on the same flat plane as the unprinted surface. Bau Cukuri at the etching press. Traditionally, dry point engravings were made by scratching the image or lines into a copper or zinc plate. The Kuru artists use plastic or perspex. It is easily available, cheaper and softer to scratch. It also has the advantage that it is transparent. The artists make their drawings on paper, put the transparent plastic sheet over it and scratch the lines by using a sharpened needle. After the image is incised to the artist’s satisfaction, the plate is inked by rubbing the ink into the scratched grooves. The surface is wiped clean, after which a dampened piece of paper is put over it and both are put through the etching press. A dry point engraving by Sara Cao. 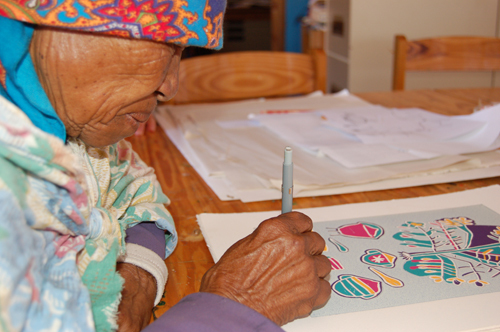 To further ensure consistency in print quality and to assist the artists, the Kuru art project employs a printer. 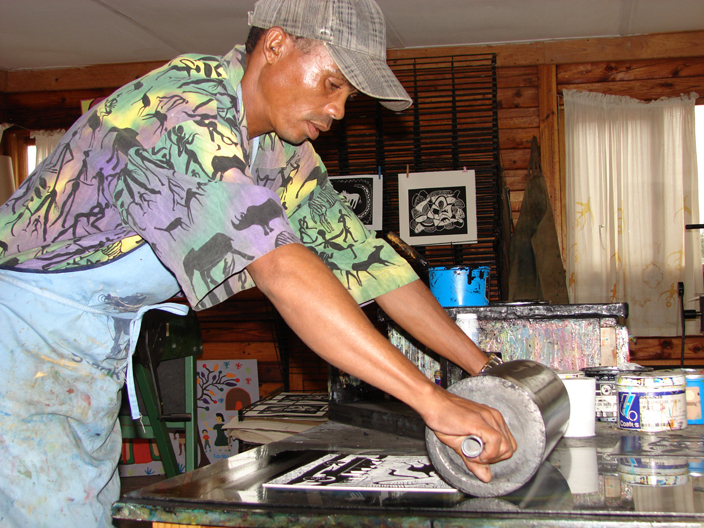 Ndodonyane Ditsheko is a skilled relief printer and is of great help to older artists who struggle to do the registration of each print perfectly. 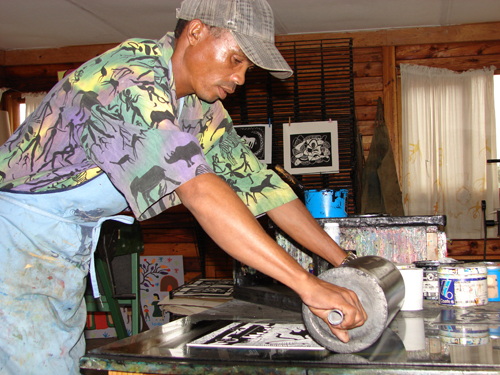 Ndodonyane assisting artist Cgoma Simon with a reduction lino print. Lithography as printing medium has existed since 1789. Unlike other printing techniques, the printed and non-printed areas share the same surface. It works on the principle of grease repelling water and adhering to ink. Thus the materials that the artists use to make their image with are “greasy” and these are the areas that will pick up ink from the roller. The rest of the plate or stone surface is covered with a thin layer of water, which serves to repel the ink during printing. In this way the drawn area of the print is what is transferred to paper. The complicated technical nature of lithography takes time and knowledge to do effectively and usually requires that the artist collaborates with a skilled master printer. Xgaiga Qhomatca making a drawing for a lithograph at the Artists’ Press studio.